Photo: Open pit at Hart. Eastern Mojave Vegetation Open pit at Hart. From time to time since 1929, the Standard Sanitary Manufacturing Co. has explored a deposit of clay half a mile south of the Hart Consolidated mine (no. 129, pl. 2) on the south end of a ridge that extends south from Castle Mountains. in 1929, there was a tunnel 200 feet long from which a large chamber to the surface has been opened. It has recently been mined. 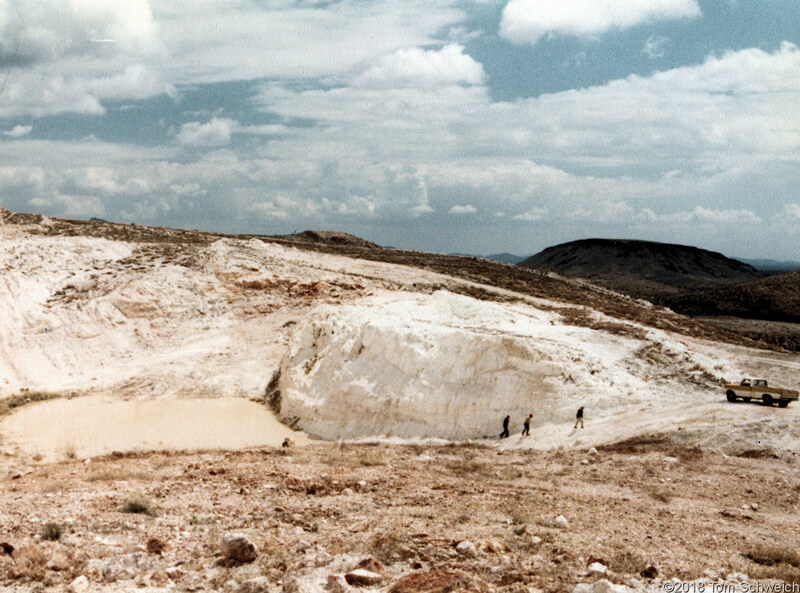 The nearly pure white clay represents rhyolite tuff in the section of flows and tuffs of middle Tertiary age that have been altered by hydrothermal action (Hewett, 1956, pg. 163).